The Nex-Tech Wireless Athlete of the Month from Western Kansas is Hoxie senior wrestler Chris Cox. 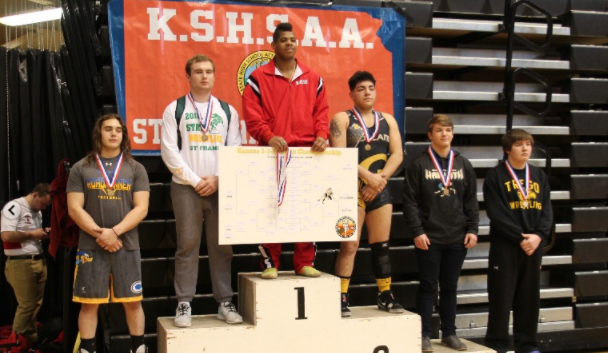 Cox captured the 220 pound state title in 3-2-1A late last month by defeating Luis Ledesma of Goodland (Dec 8-6) in the title match. Cox finished his outstanding senior season with a 35-5 record. Cox was also an all 8M-I pick in football this past fall for the 8M-I state champion Hoxie Indians. Dayton Porsch also finished with a state title for Hoxie at 145 pounds. Zack Sherman and Dylan Weimer earned fifth place finishes. The team took six wrestlers which finished third place in the state. Nex-Tech Wireless would like to congratulate Cox on his state wrestling title and Hoxie (88.5 points) for finishing 3rd in 3-2-1A wrestling. Sports in Kansas and Nex-Tech Wireless are in partnership over the 2017-2018 school year to release a Central Kansas and Western Kansas Athlete(s) of the Month, two separate monthly honors. Schools west of Russell, Kansas (including Russell) in the Nex-Tech Wireless footprint (click to see) qualify to be nominated for the Western Kansas Athlete of the Month and schools East of Great Bend (including Great Bend) qualify to be the Central Kansas Athlete of the Month (click to see). You can nominate an athlete over the last seven days of the month by emailing Chet Kuplen at sportsinkansas@gmail.com, please provide stats.